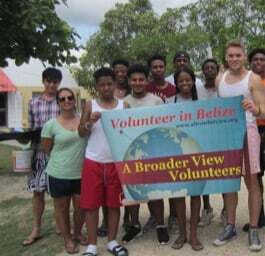 With housing available up to 20 volunteers, A Broader View has hosted hundreds of high school student groups, teens and family volunteer programs in our Belize volunteer program. For many high school students their service in Belize accounts for academic or community service credit through their school. Teenage volunteers (16-19) programs are popular over Spring and Winter Break, and for summer volunteer abroad projects. If you have a group of 5 or more interested in volunteering together, customized programs can be arranged. A Broader View Volunteers has extensive experience working with students and teachers providing tailor-made service trips for small groups. 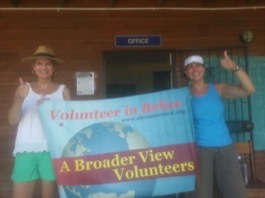 Volunteer in Belize, offer an unparalleled opportunity to discover one of the most fascinating lands of Central America. Belize is a stable, democratic country that lies on the eastern Central American coast; nestled between Mexico, Guatemala and the Caribbean Sea. Belize is culturally unique among Central American nations. It is the only nation in Central America with a British colonial heritage. The country is a sovereign, democratic state, and Her Majesty Queen Elizabeth II is the constitutional Head of State In Belize over half of the tiny country is covered by tropical rainforest whilst offshore the second largest barrier reef in the world can be found as well as over 200 cayes (islands). The official language of this multi ethnic, multi lingual country is English although the Creole dialect and Spanish are widely spoken. Belize has a population of just 266,440 with nearly 50% of this population under 18 years of age. Volunteering in Belize will provide you the chance of a lifetime to explore this mysterious country while giving back to the community. Our volunteer projects allow you to support local children, at the orphanages program and the onsite nursery school. Volunteering with us and Gain a Broader View of the World.